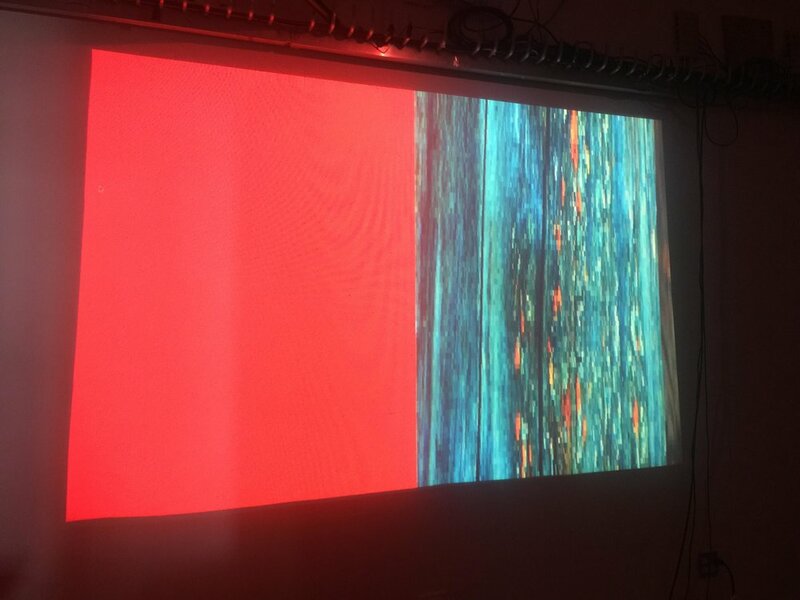 To take the projects I had done in this class so far to another level and also inspired by Gabe's suggestion to incorporate data, I decided to combine my interactive Jitter patch and video mapping projects into a new project where the sound and visuals are controlled randomly by data. For the sound, I sent the MIDI data to Logic, where it automatically triggered notes on a software synthesizer. For the visuals, I used Syphon to pipe the colors being automatically generated from the Max/Jitter patch into MadMapper, where I assigned the colors to many circles or "petals" in rings. The first ring closest to the center is the original color coming from Jitter; the second two rings are inverted from the first then adjusted slightly to be different shades. For the center of the flower, I used the Chrome extension Fatkun Batch Downloader to collect the images from the first page of an image search for "wildflower." In MadMapper I set the images in a folder to be triggered by the audio input from Logic, which controlled the speed at which the center flips through the images. Between notes it stops and rests on a random image from the collection. 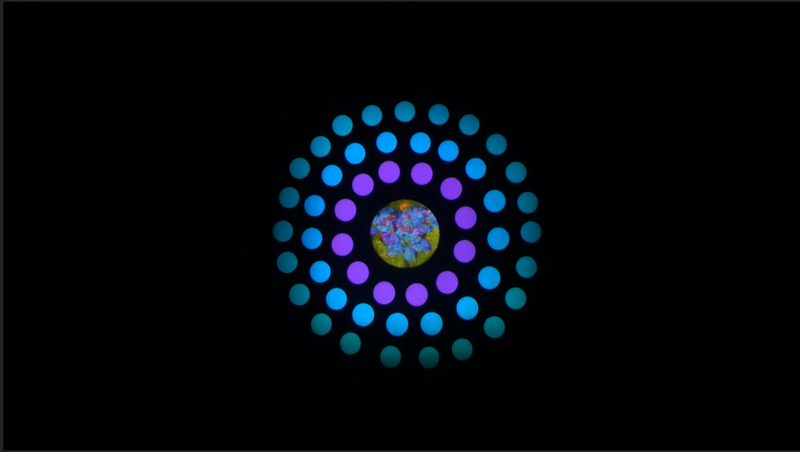 For the presentation, I projected the flower onto a wall with the center mapped onto a thick panel of circular wood, with the "petals" radiating out around it. Through working on this project I learned how to make an algorithmic Max patch to control sound and video with MIDI, and how to send video/images and MIDI data to MadMapper. There are many possibilities that could stem from this. Interactive Color Wheel Grid Installation: "Rubik's Color Wheel"
I got 9 wooden squares to recreate the grid that I originally used in our classroom and hung them in my studio. I used a level hung them first using push pins, then nails, then velcro, but I think they still were not perfect. It would be easy enough in the future I think to develop a better system for hanging them, but it is close. While in the first version of this project I triggered the colors manually, for the second version they are being triggered with a small MIDI keyboard. 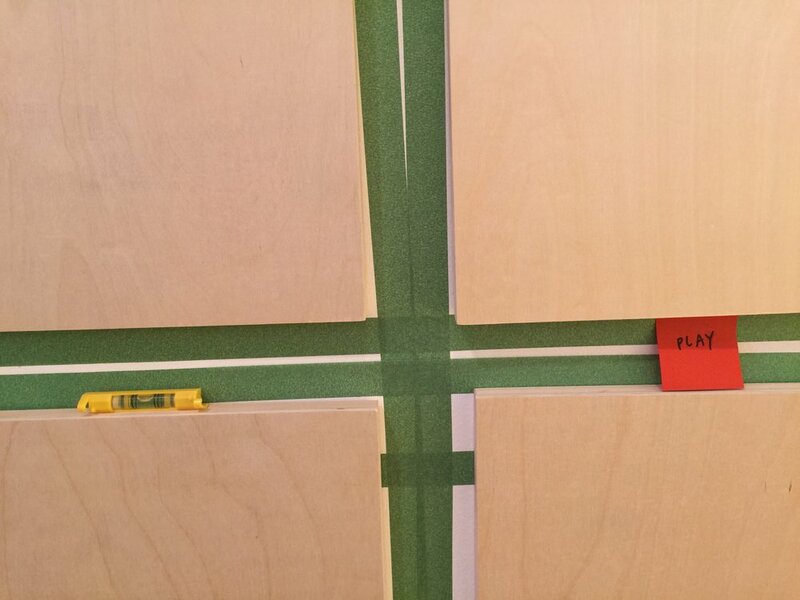 The idea for this version is that it would be interactive (maybe for kids, in a children's museum) and played like a musical keyboard that lights up different squares on the grid. I had my friend play it for the documentation to show how it works. See below for the video. Color Organ / Video Paintings Installation: "The Synchronizer"
I decided to install the piece on two gesso boards, which are sold as "liquid art" surfaces, and present it with a keyboard on a keyboard stand in front of it at Gabe's suggestion. I was thinking this could either be a permanent installation where the viewer can play to activate it, or it could be used as a backdrop or "video sculpture" to accompany a live musical performance. My friend also kindly lent her time to play it for the documentation. See below for the video. 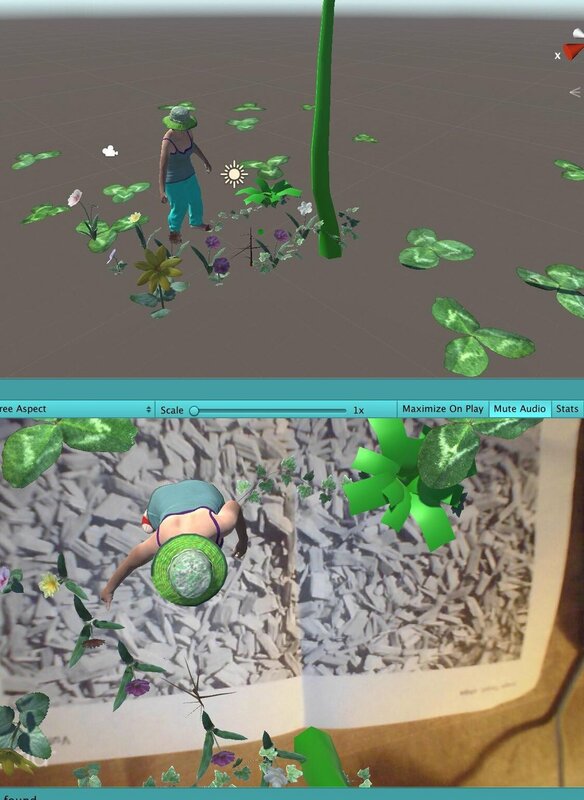 For my animation in Unity I made a character who if you don't look too close could be me, and focused on the idea of this character planting a virtual garden in AR. I got the animations to work (digging and planting seeds, crawling, planting a plant, get up from crouching to a stand, planting at tree, watering the plants) with some assets downloaded from the Unity asset store. The next step would be to develop it as a game/meditation/art piece where you can move the character with key strokes, and possibly time the growing plants or trees to grow after you choose the "plant tree" animation, etc, so it could be a little interactive garden that responds to your actions. For our assignment using a Jitter patch, I used a MIDI Keyboard (the Korg Nanokey) as a controller and mapped each note to show a color on the left which correlated to the note, as well as a chosen video on the right. The video on the right was taken from a found video of a nature reel on YouTube that I cut up and zoomed in on a lot to make it pretty much unrecognizable. The interaction is that you can play the keyboard and hear a sustained note that is meant to ring out, over a constant soundtrack of nature sounds from the video which it as sourced from (wind, birds, a plane flying overhead.) The idea was to create a feeling of meandering around with no real aim or purpose, and it is intended to be played slowly. 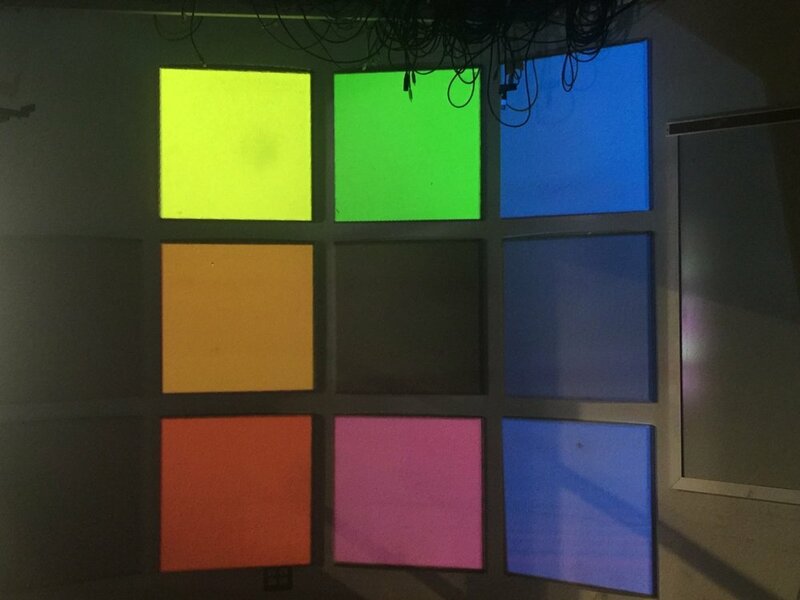 For this project I used some panels in our classroom as a surface to assign one color to each square. I manually turned on each color which also was accompanied by its correlating sound. I will be documenting this project again with video.